It started with a voice memo last Feb. 17, three days after the deadliest high school shooting in United States history. The chords that Andrea Peña texted her classmate, Sawyer Garrity, seemed to be pouring out of her on that Saturday. The classmates were two of the 65 theater program students hiding in a closet during the massacre at Marjory Stoneman Douglas in Parkland. Peña, then a sophomore, and Garrity, a junior at the time, had been listening to music in the ensuing days “just to get through everything,” Garrity says. But the emotions that were building inside needed an outlet. Peña, who has been playing piano competitively since kindergarten, sent the chords, which soon became an entire chorus. By Monday, the song co-written by Peña and Garrity, was complete. Two days later, “Shine” would captivate a national television audience, thus beginning a journey that would lead to more than 400,000 views on CNN’s YouTube page, some 300,000 streams (and counting) on Spotify—and a year of events, appearances and nonprofit work that has taken Peña and Garrity all over the country. Initially, Peña and Garrity saw their creative effort as little more than catharsis. In fact, the two were so focused on writing “Shine” as an outlet for themselves, the song almost never made it past their smartphones. “We never thought we were going to record it,” Peña says. CNN’s Jake Tapper heard that truth as the teens rehearsed prior to the Town Hall. The girls’ performance alongside members of the school’s drama club originally was supposed to be an opener, with maybe some B-roll, but Tapper wasn’t going to let that happen. With that, “Shine” became the closing number to the live broadcast, which drew a total of 2.91 million viewers, according to Variety. As Peña played the keyboard, her eyes were locked downward since the girls had written and learned the song only days before. But when she finally took in the scene at BB&T Center in Sunrise, she saw something that she says will stick with her forever. Since the very public debut of “Shine,” the song has continued to resonate. Its CNN recording has been viewed more than 419,000 times, the song has been streamed across platforms such as Apple Music and Spotify hundreds of thousands of times, and an accompanying music video filmed at the high school debuted in May to acclaim from such publications as Rolling Stone, Billboard and Teen Vogue. 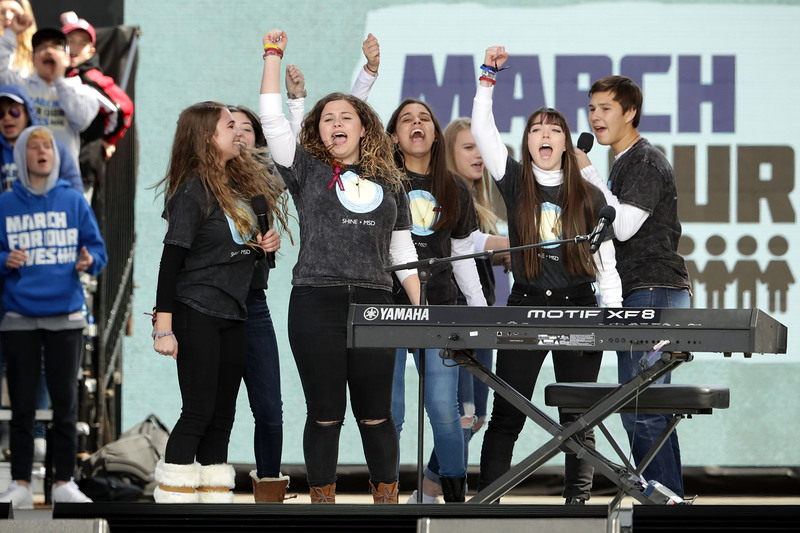 Peña and Garrity have performed the song countless times at events large and small, including against the backdrop of the U.S. Capitol at the March 24 March For Our Lives, as well as at an intimate dinner in Washington, D.C., for the families of the 17 victims. Along the way, “Shine” has birthed an entire movement and purpose for Peña and Garrity. 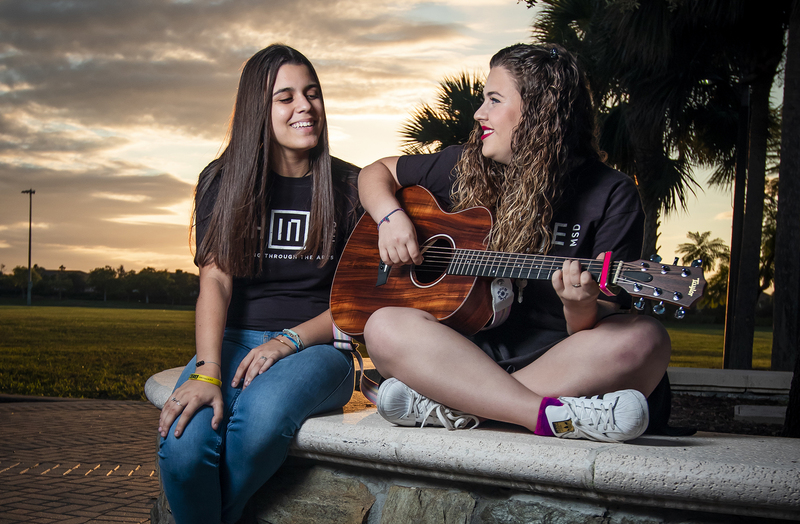 The girls co-founded Shine MSD—a nonprofit organization dedicated to providing mental health programs that center around the arts to communities in need, starting with their own. Through a combination of profits on iTunes from “Shine” downloads, as well as donations, Peña and Garrity were able to host Camp Shine, a summer camp for Parkland students that featured certified arts, drama and musical therapists serving as counselors. Peña describes Camp Shine as a “healing of the arts camp.” About 60 children, ranging in age from incoming freshmen to seniors, participated over the summer. In the music track, students wrote songs; in drama, they acted out scenarios; in art, they painted masks that illustrated how they felt like they were perceived. Guests included Manuel Oliver, father of one of the student victims, Joaquin Oliver. Manuel has been channeling his grief and gun-violence prevention activism through painting murals across the country. At Camp Shine, Oliver worked with the students to paint a mural with a diamond. “Through our foundation, we hope to shine a light for our community and show people that even through darkness you’re never alone,” Peña says. Despite overseeing a nonprofit organization before even being old enough to vote, the girls still grapple with the song’s success at times. “I find myself going to events and feeling like this should not be a thing, almost feeling guilty for being there,” Peña says. Like so many of the MSD students who’ve made a difference through their words and actions since last Feb. 14, Peña and Garrity seem wise beyond their years. But they’re also, in many ways, still your typical high schoolers. They talk about homework, ice cream and their Stoneman Douglas teachers, jumping from topic to topic at a mile a minute with each other. They speak in gibberish so their parents can’t intrude; they promise to finish their homework and not to be out too late; they giggle like, well, high school girls. Beyond the inherent emotion attached to it, part of the song’s ability to connect can be traced to its lyrics and composition; it was direct enough to give the Parkland community some desperately needed healing, but ambiguous enough that it could serve as an anthem for whatever a person is going through. “Shine” also has helped inspire the girls as they start to figure out what they want to do after high school. “Before everything happened, I was set on my life being musical theater and going to Broadway,” Garrity says. “But after everything happened, I realized I have so much more I want to say. I really want to go to school for songwriting because I’m self-taught, so I want to get better training. Peña still has a couple of years to go until college, but since the song’s success and the founding of Shine MSD, she’s been toying with the idea of opening a physical and musical therapy practice.